The first time I had arancini I was working a food festival selling lobster rolls. I used to work for a certain lobster roll company in New York, and actually it's still one of my favorite jobs I've had. We would go to all sorts of events, build a little lobster roll shack + pass out buttery lobster rolls all night. But back to the arancini. So at one of the festivals a little company called Arancini Bros also had a booth. It's common at catering events to barter with the other vendors for food, since you both have really good food to swap! From the moment the event started I knew I wanted one of Arancini Bros perfect arancini because I had never one before. They gave me one on the house, and it started a serious addiction for me. Arancini are basically like giant stuffed rice balls, but deep-fried. Usually made with leftover risotto, they're creamy on the inside + crispy on the outside. Basically they're real good, and you can stuff them with anything you have on hand too! Since football season is officially here I have a great excuse to make these arancini all the time because they're football shaped AND rep my favorite New York team's colors, green + white. 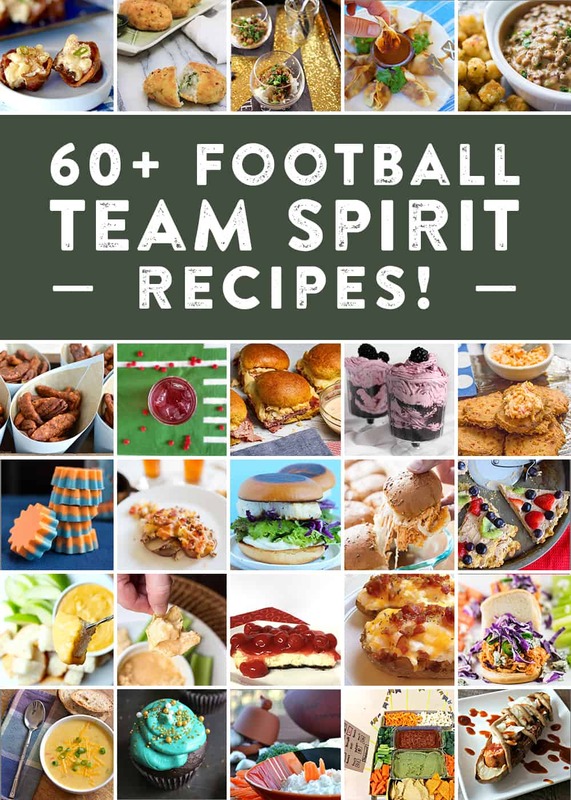 In celebration of football season, I've joined a group of bloggers from all over the country to bring you football-inspired recipes. A few weeks ago we shared our favorite tailgating recipes, but now we're sharing 60 recipe ideas for celebrating on game day. You'll find a recipe for all of your teams, so click on the links at the bottom of this post to join in. Go team! Start by getting the rice going. Cook the rice in 3.5 cups of water mixed with the white wine according to the directions on the package. You can even use a rice cooker if you've got it. Once the rice is done, let it cool. You'll want the rice to be sticky. Meanwhile make the pesto. Pulverize the basil, pine nuts, parmesan cheese + garlic clove in a food processor. Drizzle in the olive oil + keep blending until smooth. Set aside. Before you assemble, set up your breading stations. Place the flour on one plate, the breadcrumbs on another plate + beat the eggs in another bowl. To form each arancini, flatten a palm-sized chunk of rice with your hands. Add 1/4 teaspoon of the pesto + 4 or 5 small chunks of mozzarella into the center. Carefully cover up the pesto + mozzarella, forming the entire thing into a football-shaped ball. Repeat until you have no rice left. Toss each rice ball into the flour, then the egg + then breadcrumbs. Repeat with each ball. Fry each rice ball in hot olive oil until golden brown. You'll want to have enough olive oil in the pan to do a shallow fry. Drain on a paper towel. Serve each aranicini warm with a sprinkle of flaky salt + leftover pesto for dipping.